Welcome to Ash Ave. Comics & Books official website! 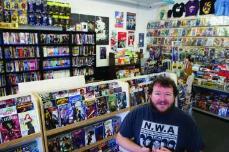 Ash Avenue Comics & Books has been a fixture for comics fans in the valley for ten years. We carry a wide selection of new comics, both mainstream and indy, mini-comics, magazines, toys, t-shirts, and a massive selection of graphic novels. Our indy comics selection is the best in town, hands down! Come on in, and check out Tempe’s best comic store! If you have any questions, comments, or feedback, please contact us.